Most mornings my bus is late or early when dropping me off so that I end up doing the 12 minute walk to work. 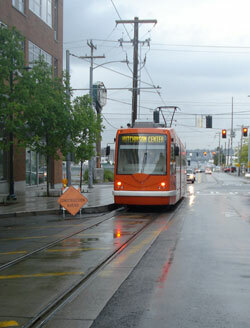 But, on some days I get in around the right time so that I can take the trolley down the street to my office. One of the many things that irritate me in life, are people like the guy this morning. He wasn't unique as I encounter people like him all the time. We were all crammed on the trolley because it is free to ride and raining. As it gets closer to the stop that I and quite a few other people also get off on, some guy tries to work his way past me in the crowd. He was polite about it, said "excuse me." Feeling cranky today, and knowing half the people on the trolley were getting off at that same stop, I respond, "we aren't even at the stop yet. Relax you'll make it off." You could see the look of not knowing how to respond in his eyes, the slight nervous smile, and of course the looks from the other people on the trolley. Of course no one saying anything, like "yeah, chill." A couple of seconds later, the trolley stopped, the doors opened, and everyone managed to make it off the trolley including that guy. One of these days, when I create my list of things about people I hate, on the list will be impatience. Because really, is getting to work a few seconds earlier that important!